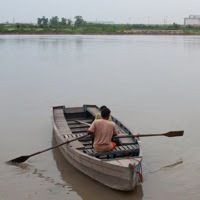 The word Katha in Yamuna Katha literally means story, the story of river Yamuna. In ancient India, there existed a cultural tradition of telling stories. There used to be a kathakaar (the story teller) and there used to be a subject. The katha sessions, however, were never meant to be a plain narrative going on and on in front of a passive audience. It was necessarily an interactive platform which would combine several performing genres such as the ‘act’ of storytelling, the drama involved in taking the narrative further and an integral part, the music. Yamuna Katha from October 11-15, 2011 draws inspiration from this rich legacy. We plan to bring in diverse genres – walk along the Yamuna, expert talk, panel discussions, stakeholders’ interaction, boat ride, dastan goi (one of the methods of storytelling) and even wrestling – together during the sojourn. Possibly for the first time, this is an attempt to bring people with diverse backgrounds on a common platform for a real time exchange on Yamuna. Through various sessions, we wish to understand the different aspects of the river-city dyad and how it has undergone change over the decades. While weaving the narrative of the Yamuna, we will explore how it has affected the city of Delhi and also, how the expansion of the city affected the river Yamuna. All this will happen very near to the Yamuna, the subject of deliberations. The Yamuna Katha will offer a common platform to the core group comprising river specialists, school teachers, a social scientist, a historian, a haathi wala (elephant owner), a couple from fishermen community and a farmer who tills the floodplains to collectively reflect on the river crisscrossing the city they live in. It would mean – and we keep our fingers strictly crossed – that a river expert’s view is thrashed by the fisherman or for that matter, the school teacher and the haathi wala can exchange notes on the idea of ‘river ecology’. The possibilities are immense. Yamuna Katha is a collaborative effort to understand how the river-city-dyad has formed over the years; what has been the relationship between the river, the people, the flora and the fauna. It brings to a common zone, representatives of various stakeholders who are directly or indirectly connected with the river. A core group consisting of a river specialist, two school teachers, a social scientist and historian, a hathi wala, a fisher couple and a farmer will stay together between 11th and 15th October and undertake travels to the banks and reflect on the river collectively. Each day of the journey brings in new ‘passengers’ – people who accompany the core group only for that day – and bring in their perspective. Together they create a narrative to explore a common future for Yamuna. Is there a river in Delhi?